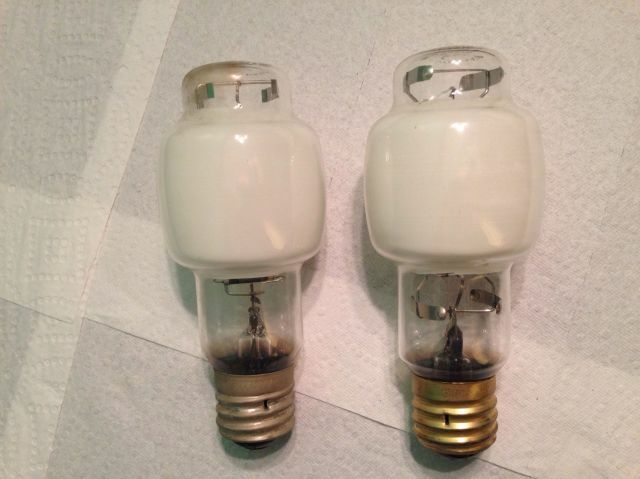 Lighting-Gallery-net - good ol' mercury vapor/Sylvania 100w /Cs, exactly 10 years apart, care to mention any differences? Sylvania 100w /Cs, exactly 10 years apart, care to mention any differences? Left, mfd February 1969. Right, mfd February 1979. Anyone detect any differences? Different resistor/getter configuration in the bottom. Different support configuration at the top. The left one appears to lack a bottom support altogether. Nice lamps! I heard the 100W Sylvania lamps were no good after the 60s though. The envelope also got bigger as well on the right. I think that's an illusion of the camera angle since the base looks bigger on the right too. Correct it's just the camera angle. Both are the same size. Mike I heard it was the 1960s models that were crap. Joe M said all the clear 100w Sylvanias installed by Boston Edison in the late 60s failed by the early 80s while the higher wattages lasted much longer. But 12-14 years still isn't too bad. There is a difference that's not visible in this pic. The phosphors are a bit different. The 1979 model has a little bit of the phosphor used in /DX lamps, giving it a warmer appearance than the 1969 model, and may green out a bit less also. Dave: did you see my Facebook message? Ah maybe that was it. Joe has told me that Sylvania 100W mercs had undersized electrodes so they didn't last as long. Forgot the era though. I'm not that sure about the 1970s models being any better. The tiny electrodes seem to be the same in both eras. Yup---they had tiny electrodes. They blacken the arc tubes fast and when they go they just quit. I had a 1978 /DX in the "beehive head" Wheeler with the quarter moon reflector out on my shop out back, and it was not used too much, was quite bright when I installed it with that lamp back around 2002-03 ish, and it was DEAD by about 2005-06! The arc tube blacened quite a bit in that span and one night it never started again. It got further finished off last fall when I had it sitting on the floor of my shop in the basement, to retest it, and my Uncle Bob stepped on the base while it was in an old Sylvania wrapper. It busted just above the base, but hey---I can examine the arc tube now! And plan to perhaps throw a PL blacklight inside the bulb and make a pink glowing lamp out of it! I screwed the intact base, stem, frame and arc tube into my 175 watt re-ballasted GE M-400, and tried it and it won't start at all. It glows a little with my lamp tester antenna, but won't start, and appears to have a busted electrode perhaps. They were indeed junk---sad to say. But the later lamps were actually quite good. The odd ET-25 shape and ED shaped USA made ones are nice. Big electrodes and all! I installed a used 1974 Westinghouse fully phosphored BT-25 in the Wheeler quartermoon beehive and never looked back! Actually, since the 100 watt lamps run at 120 PSI pressure, and have everything smaller than is typical, even with 50 and 75 watt merc lamps, for their size, they are the most dim-out prone across all brands, and also prone to complete passive outages as well. Cheers! Rick "C-6" Delair! Neat! Say, I wonder if underdriving said lamps with undersized electrodes would make them last a lot longer? That would seem to make sense. Good question, I doubt it really. Underdriving mercs can be hard on the lamps, it can accelerate electrode sputtering/wear. And it can overheat the ballasts on certain types. Exactly my point. Opposite to my point, rather. If a lamp has electrodes too small for the power it's rated for, then the electrodes are being overheated in normal use, hence the shorted life. Therefore, when the lamp is underdriven, the cathodes are actually being heated to their optimum temperature. This is the same reason 25 watt F40T12 shoplight lamps don't last very long on full-power ballasts - the skimpy cathodes on them are being overheated. This is my speculation, anyway. Could be. And as for the 25w shoplights, the cathodes are identical to those in F32T8s, believe it or not. At least the cold resistsnce is the same. That wouldn't surprise me - they're rated for almost the same current, after all. GE made the "T8 lamp in a T12 size" for a while, they came in colors such as SP35, etc. Walgreens used them for a while, they were awful. Can you elaborate more? I think I have have heard of them but I'm not sure. What will they do to older full-power RS and preheat ballasts? It was a special line of T12 lamps designed for T8 ballasts, I forgot the trade name. They'll be overdriven if run on full wattage T12 ballasts. Same for the worklite junk, they are rated at 6000 hr when run at 40w. Right...but won't hurt T12 ballasts, correct? I know the "shoplite" lamps and that concept, so I guess it makes sense. I just don't understand the logic behind the T12 lamps for T8s, unless you're really concerned about authenticity in old fixtures or something. And the "shoplite" lamps were/are stupid too IMO...but they're only because it was a loophole in the '90s EPACT ban, right? (a "Residential" grade F40CW). But aren't those banned too now? I saw some Sylvania 25w 4' CWX, that's why I ask. Really cool! Never knew such a thing was made! I suppose maybe it was so the photometrics (well whatever photometrics fluorescent fixtures have lol) doesn't get messed up and maybe to maintain a low surface brightness? Wow, I've never heard of the "T8 in a T12 size" thing before, either! The 1979 bulb appears to be slightly fatter, extra support on the bottom.and appears to be factory fresh by looking at the brass base. I never thought about optics, but I was thinking more like exposed-lamp fixtures. A vintage F40 shoplight or strip won't look right with T8 lamps if you're really OCD.